The personas of Cripple Creek’s famous and infamous, millionaires and paupers, celebrities and commoners, come to life during the yearly Mt. Pisgah Cemetery Tour. 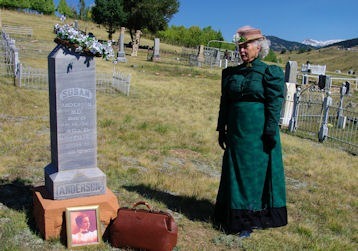 Members of the Gold Camp Victorian Society assume the roles of former residents buried in the mountainside graveyard overlooking the historic mining district. 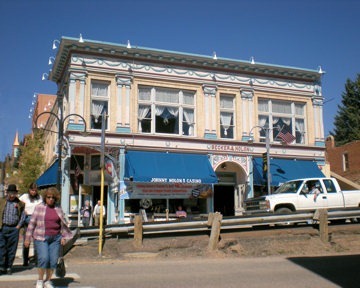 Tours begin in the parking lot in front of the Cripple Creek District Museum and the Cripple Creek & Victor Narrow Gauge Railroad Depot. A historic trolley transports each tour group to the cemetery. 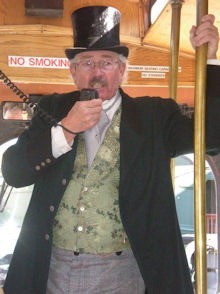 As we travel through town a costumed guide sets the stage with historic background. “Digger O’Dell Martenson” welcomes the tour to Mt. Pisgah and describes how graves were once “dug” by dynamite. Approximately 4,000 souls – including 2,000 paupers without headstones – and one horse lie in final repose. 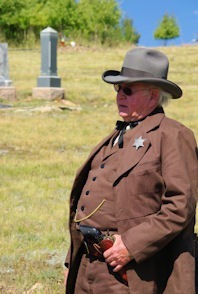 From extensive research the reenactors are well versed in the lives of their “characters”. We meet Vitus Neilsen – Cripple Creek’s blind piano man, Civil War veteran David McClintok and George Smith leader of the Elks band. Each tells “their” story incorporating historic fact and interesting antidotes. Mabel Barbie Lee tells of teaching in Victor where Lowell Thomas was one of her history students. She later taught at Colorado College and served as administrator at numerous universities including Ratcliff, Bennington and the University of California. In retirement she wrote memoirs including Cripple Creek Days about the gold rush boom days and Back in Cripple Creek. Cripple Creek’s most renowned lady of the night was Pearl DeVere, madam of the Old Homestead House brothel. Always liking the finer things in life, legend has it that Pearl was buried in a $1000 designer dress from Paris paid fo r by an anonymous Denver donor. Pearl’s funeral procession was led by four mounted horsemen and a 20 piece band from the Elks Club. 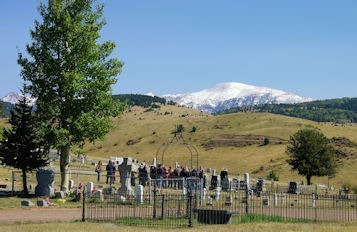 Carriages filled with businessmen, girls from “The Row” and miners followed the lavender casket up Cripple Creek’s main street, Bennett Avenue, to the slopes of Mt. Pisgah. More than a century later Pearl’s grave is one of the most decorated in the cemetery. Working downhill through the cemetery we meet more than a dozen “residents.” The tour group enjoys lemonade, coffee and cookies as the they wait for the return trolley. We’re delighted we came to Mt. Pisgah Cemetery where history comes to life one day each fall. When You Go: The 2010 Mt. 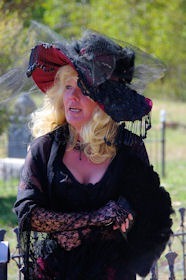 Pisgah Cemetery Tour is scheduled for Saturday, September 18th. Tours leave from the Cripple Creek District Museum parking lot, 5th Street and Bennett Avenue, every half hour starting at 9:30am. The last tour will leave the museum at 2pm. It’s advisable to arrive early. Donations benefit the Gold Camp Victorian Society’s historic preservation efforts – $8/adult, $15/couple, $5/child under 12. With an elevation of over 10,000’, the uneven terrain and standing for over an hour the cemetery tour may be a challenge for people with health issues. Wear sensible shoes and dress in layers as weather can change quickly.